Texas ranks 44th among the states in overall child health and well-being, according to data released today by the Annie E. Casey Foundation in its 2012 KIDS COUNT Data Book. Click here to the full presentation on the KIDS Count Data Book. Click here to access our webinar recording on the KIDS COUNT Data Book (audio and visual). The 2012 data book explores how our kids have fared during the last decade�"some outcomes are positive, some negative. But positive or negative outcomes for kids don’t just happen. They are the inevitable results of effective or failed policy choices. The State of Texas Children 2012 combines data and policy to tell the story of Texas kids. It’s time we learn from our past choices, positive and negative, so that we can shape a different story for our future. 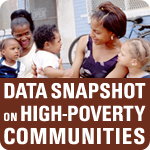 In its first data snapshot of the year, the Annie E. Casey Foundation’s KIDS COUNT explores the increased number of children living in America's high-poverty communities. Texas has the 4th highest number of children living in areas with 30 percent of residents or more living below the poverty line at 17 percent. And of the 20 cities with the highest rate of concentrated poverty, three are located here in Texas: El Paso, Dallas, and Houston.